Southern California's Salton Sea is a strange, barren, post-apocalyptic landscape wrought by natural disaster, man-made failure, and unique desert habitation. I took a camping trip out to the Salton Sea Recreation Area a few weeks ago to enjoy the crunchy fish-bone beaches and explore the abandoned yacht club, and was thoroughly impressed and mystified by the surroundings and residents. In a moment of serendipity, a copy of Chris Metzler's and Jeff Springer's documentary film, which had a limited theatrical run beginning in 2006 and was released on DVD last fall, fell into my lap just about a week ago. Given the subject matter, the film could have easily been made as a tacky tale of patronizing insight about the Salton Sea and its inhabitants, and while John Waters' voiceover narration and Friends of Dean Martinez's Western/tropicalia soundtrack do offer a small dose of kitsch, the filmmakers do a commendable job of giving one of America's weirdest places a fair shake. 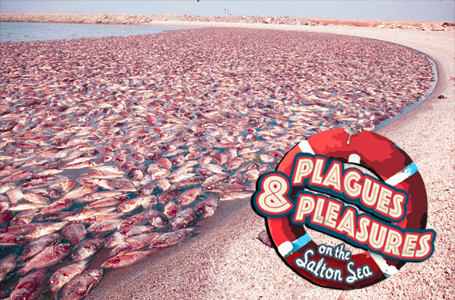 Plagues & Pleasures on the Salton Sea presents the Sea from a variety of angles - social, environmental, historical - and gives the residents and the wildlife refuge rangers a chance to speak for themselves and tell their own stories, as strange or as serious as they may be. 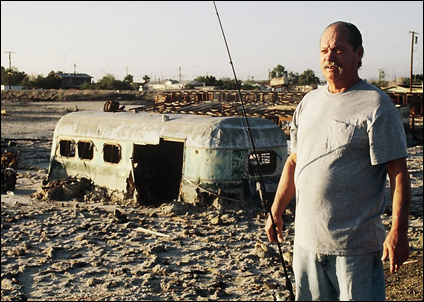 Paul Clement in Bombay Beach. The Sea was created in 1905, when an irrigation engineering accident in the Imperial Valley caused a heavily swollen Colorado River to burst through a retaining dike and flood the depths of the Salton Sink, one of the many dry depressions in Southern California's Colorado Desert. The resulting surge of water created the Sea, destroying homes and swallowing up land in the process. American ingenuity took over from there, and throughout the 1950s and '60s, the Sea became a resort destination with water sports, fishing, and marinas for the rich and playful, ultimately reaching a scale that rivaled Palm Springs, sixty miles to the Northwest. The documentary employs clips from some hilarious promotional films from the era to show what the Salton life of leisure consisted of at the height of its popularity. 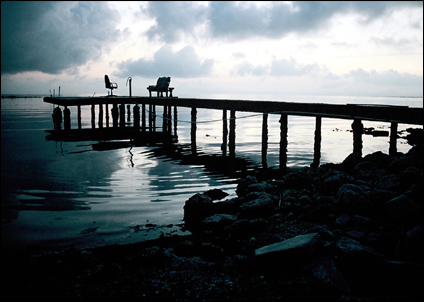 Then, in the 1970s, the lake began to flood, destroying much of the prime beachfront property. Over time the Sea's extreme salinity level, which is higher than the Pacific Ocean, combined with regular and massive fish die-offs, severe economic depression and land devaluation to create the bizarre situation of the Salton Sea we know today. Norm Niver's dock in Salton City. 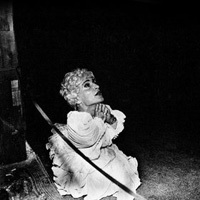 Throughout the film Metzler and Springer interview a wide variety of characters, some of whom seem to be quite literally insane and some of whom offer lucid insight into life on the Sea. The unofficial mayor is a former Hungarian freedom fighter named Hunky Daddy, a man who enjoys leering at women and speaking in non-sequiturs. 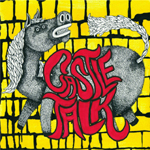 Another man talks of eating the Sea's tilapia raw, a kind of desert sashimi. One woman discusses how much safer and cheaper it is for her kids to grow up there than in the gang- and drug-infested streets of inner city Los Angeles. Many of the interviewees, appropriately enough, seem like character sketches for John Waters' classic Pink Flamingos come to life. 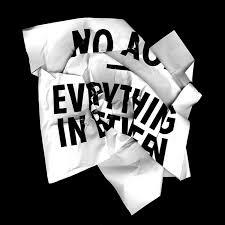 But as eccentric as they might be, they are all treated with decency and respect. 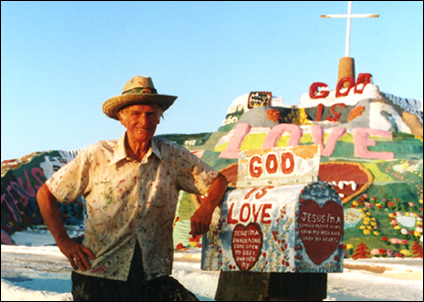 Leonard Knight next to his Salvation Mountain. Metzler and Springer devote a good portion of time to the environmental struggle raging on the Salton Sea between birds, fish, and botulism, and the politics of water-grabbing and agricultural runoff, orchestrated at a distance from San Diego to the Central Valley, that affects the composition and life of the Sea. But the people and their lives are the real bread and butter of this documentary, and despite the odds, despite the odor of dead fish that often permeates the air (I can vouch for this firsthand), despite the almost worthless land, despite the intense heat and isolation - despite it all the residents of the Salton Sea communities seem to be happy and defiantly independent from the rest of the world. And this air of triumph, however small, in the face of overwhelming adversity, is the crux of what makes Plagues & Pleasures such an enjoyable film. Jonah Flicker writes, lives, drinks, eats, and consumes music in New York, via Los Angeles. He once received a fortune in a fortune cookie that stated the following: "Soon, a visitor shall delight you." He's still waiting. See other articles by Jonah Flicker.